Just a day after Sandy gave a damaging visit to the New Jersey coast, hundreds of reports of damaged vessels have come in, along with reports of damaged marinas, boat clubs, boat yards, and infrastructure. With the numerous boats that have been beached, damaged or sunk by Hurricane Sandy, owners across several states await recovery. Follow these tips to get the salvage process started quickly and to preserve whatever value the vessel may still have after Sandy. For a boat washed ashore, remove whatever equipment possible and bring it to a safe place to protect these items from vandals and looters. Put your contact information in a conspicuous place on the boat, and a “No Trespassing” sign to help deter unwanted visitors from your boat. Do not climb in or on a boat that is dangling from dock pilings or other obstructions, or boats that are piled up together. To protect your boat from more damage due to exposure to weather cover it with a tarp, or board up broken hatches or windows. As soon as you are able start drying the boat with electric air handlers, or take advantage of sunny weather. Wet cushions and other such items should be removed and dried to prevent mold and mildew, and saved for potential insurance claims. Submerged engines and other machinery should be flushed with fresh water and then filled with diesel fuel or kerosene, also known as “pickling”. For boats that are sunk or need to be moved by a marine salvage company, it is recommended that you receive approval from your insurance company before signing a wreck removal contract with anyone. Here are some tips to salvage and get repairs done right. 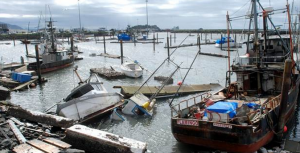 Many recreational boaters have a difficult time getting the right salvage and repair help after a hurricane. There are some insurance programs that arrange everything for you, and others that will offer some help, but uninsured boaters don’t have this help. Steer clear of the inexperienced: Base your decision on hiring a salvage contractor on their skill and experience, not on a low-ball price. Fly-by-night operators come in to the picture far too often after situations like a hurricane, and end up causing more harm than good. Make sure to ask how long they have been doing boat salvage and repairs and ask for references. Make sure to call those references! The long haul: There are some signs to look for to tell if a business is in it “for keeps”. A company that is in a trade association embraces standards and acknowledges codes of ethics for the industry, which is one of the tell-tale signs to look for. American Boat & Yacht Council – www.abycinc.org develops standards of safety for the maintenance and repair of boats. Shops that follow ABYC standards are recommended to boat owners seeking hurricane repairs. C-PORT – www.cport.us The Conference of Professional Operators for Response Towing members include salvage and on the water towing companies provide training and god business practice, and establish standards for professionalism. Amirican Boar Builders Association – www.abbra.org is the association for shops that are dedicated to professional development, training and education, and small boat building and repair. Local Marine Trade organizations: There are marine trade associations with many members and in many regions that offer a range of services. Check your local businesses for membership.